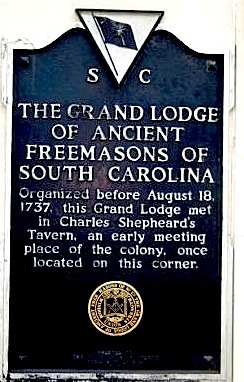 The Free and Accepted Masons of South Carolina became a Provincial Grand Lodge under the premiere Grand Lodge of England ('Moderns") in 1736. But Solomon's Lodge in Charleston was actually chartered the year before by the Grand Lodge and is the oldest lodge in the state. It bore the number 45 on the rolls of the Grand Lodge, but number 1 in the Province. Its first meeting was held in the Shepheard's Tavern at Broad and Church Street on October 28th, 1736. 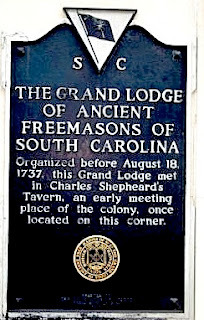 It took just another year before a competing Grand Lodge of Ancient Freemasons of South Carolina was formed, and met in the same tavern. A Special Communication will be held at 10:00 AM Saturday, October 29, 2011 to observe the 275th Anniversary of the founding of Freemasonry In the Provence of Carolina. Solomon’s Lodge No. 1 will open in due form, a commemorative plaque will be placed, and a one act play, entitled “A Lodge Is Born”, written in 1937, will be performed. Solomon’s Lodge “One Day Honorary Membership Certificates” will be presented to attending brethren. Lunch will be served. Ladies are invited to attend, and tickets are $25.00 per person (in advance and at the door). 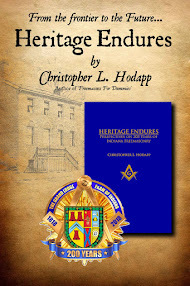 The lodge is located in the Charleston Masonic Center at 1285 Orange Grove Road, Charleston, SC. An earlier version of this entry mistakenly said the Provincial GL of SC was established in 1734. Masonic dates--like so much of Masonic history--are often confusing, and I hate to presume to nit-pick with the likes of brethren such as you on such issues, but this caught my eye. 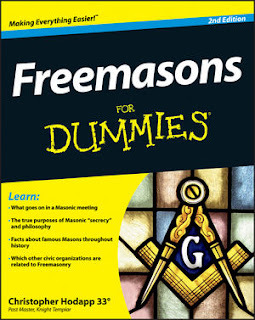 You write: The Free and Accepted Masons of South Carolina became a Provincial Grand Lodge under the premiere Grand Lodge of England ('Moderns") in 1734. On the other hand, the Grand Lodge of South Carolina, on its own web site, states at the top of each page: Provincial Grand Lodge Chartered in 1736 ~ First South Carolina Lodge Chartered in 1735. I've seen such issues come up quite a bit as I have been piecing together a Masonic Time-line for my own use. Perhaps I am wrong to do so, but I typically defer to what a Grand Lodge says about its own history rather than what other sources list. I have corrected the entry. Thanks for keeping me honest. "The Free and Accepted Masons of South Carolina" is right in part, but is known now as The Ancient Free Masons of South Carolina (AFM). The Grand Lodge of Free and Accepted Masons of South Carolina SC took the name Grand Lodge of Ancient Free Masons of South Carolina as one of the compromises made to merge the two bodies.